How much water volume do I need for my pond? It takes approximately 36 gallons per minute to make a waterfall 1′ wide x 1″ deep (1″ deep water is considered an average depth for residential applications). The first step in determining how much water you need is to multiply the width of the waterfall in feet x 36 = gallons per minute needed to make 1″ thick water over your falls. Example: A 3′ wide waterfall would need 108 gallons per minute to be 1″ thick. Next, determine how much head (lift) there is from the surface of the pond to the top of the waterfall. On a small, simple waterfall, the vertical lift is all you need; however, on large applications you also need to factor in friction loss from the pipe and each fitting to get the total head. This determines Head Pressure. Now that we know the water volume needed and the head height, selecting a pump is much easier. 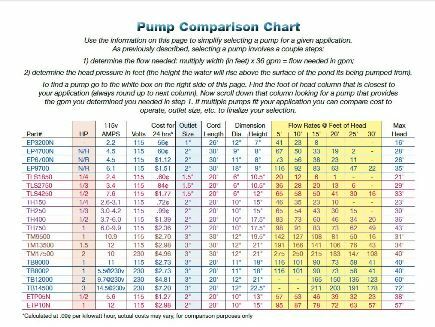 Start by looking at our pump comparison chart below. This chart lists all of our popular submersible pumps on one page. Look in the grey box on the right side of the chart, find the column of head closest to your application, and follow that column down until you find a pump that delivers the gallons per minute (GPM) you need. The depth of the water where the pump is located does not count toward ft. of head. Ft. of head is the distance the water is lifted above the pond’s surface. If you have a unique application, are using an external pump, or just want our help, please do not hesitate to call. Improper pump application is the leading cause of pump failure. We want to help you select the best pump for your application. When calling, we need to know the GPM, voltage and phase of power available, length of the pipe run, and diameter of the pipe (if already installed). Knowing the application and selecting the correct pump for the job will increase the overall performance of the feature and decrease your frustration. Self Priming. A self priming pump can sit higher than the water level being pumped by a few feet (depends on the model) and will displace the air in the suction line to prime itself. Non-Self Priming. These pumps must either sit below the water level being pumped or must have a check valve installed at the end of the suction line to keep water in the system after being primed the first time. All external pumps are designed to push water, not pull it. This means the pumps should sit as close to the pond as possible. If your pump delivers more water than your pipe can handle, you will not get the pump’s rated amount – you will get the pipe’s rated amount. Example: Frequently, contractors use 3″ flex pipe when installing a WQ1502 pump. This pump has a 3″ discharge but pumps 295 GPM at 5′ of head. Since 3″ pipe can handle a maximum of 225 GPM, the pump does not deliver the amount of water it is capable of. Always size your pipe for the amount of water being pumped. Fittings can also reduce flow. 90º elbows should be avoided if at all possible (use two 45º elbows). Inadequate power supply is one of the biggest contributions to reduced pump service life, poor performance, and premature pump failure. Low voltage caused by undersized wiring, having too many items running on the same line, and not double checking the voltage/amp draw once the pump is operating are common mistakes that lead to problems. All pumps need a certain amount of back pressure to operate correctly. Often, a ball valve is needed on the outlet side of the pump to create the needed back pressure. Without this back pressure, the impeller will pump more water than the motor is rated for, creating high amp draw and excessive heat. This will lead to shortened motor life and premature failure. By closing the valve a small amount, back pressure is increased and the motor operates within its designed service factor. The life of any pump is directly related to the operating conditions it works under. One of the most common causes of premature pump failure is LOW head. Pumps are designed to work under a certain amount of load. In low head applications, not enough back pressure is put on the pump, and it spins too freely. This causes the motors to run hot and shortens their life considerably. In every plumbing system, you should incorporate a valve somewhere in the discharge line. This valve can then be closed part way to simulate backpressure if not enough natural pressure is created. Feet of head is typically measured in terms of vertical lift. However, the diameter and length of pipe can have a significant effect on the performance of the pump as well, especially if the pipe diameter is too small. A pump must have the power to not only push the water up to the vertical height of the waterfall, but to also overcome the friction loss created by the pipe. Total Dynamic Head is the feet of head (lift) added to the friction loss created by the pipe. In most small ponds, with short pipe runs, friction loss is not typically a problem. However, in a feature with long streams or high flow rates, friction loss can have a big impact on the performance of the pump. To determine the Total Dynamic Head, add the feet of head and friction loss. Example: We are pumping 70 GPM (4200 GPH). The chart shows that 70 GPM through 100′ of 2″ pipe equals 7.76′ of head while a 3″ pipe only equals 1.13′ of head. If your waterfall is 10′ high and 100′ away, you will have a total head of 17.76′ using 2″ pipe but only 11.13′ using 3″ pipe.